Writers block. It’s the sweaty palms of a teenage boy approaching a girl to ask her out on a date. It’s the panic of the cursor just steadily blinking at you. It’s the knotted stomach of insecurity telling you to do something – anything. All you really need is a swift kick in the pants. 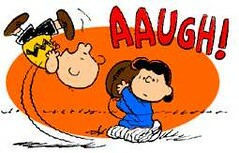 It’s like Lucy pulling the football away from good ol’ Charlie Brown. Lucy does this every-time, why would Charlie think it was going to be different? It’s the same with writing. I curse those writers who say, oh I just sat down and started typing and wa’la a novel is done and dusted. Calling it out – bullsh*t. I have tried that and quickly learned that was me just gearing up for the fun ahead. Its a part of any process – BRAINSTORM. Write to your hearts content and write some more. Let the pen, the keyboard take you in unchartered waters. However, the end never really happens until you stop and plot the course. Writers block is only a symptom of not following a system from conception – design (plotting) – research – composition. When you don’t stop to plan once you get that fantastic idea going this leaves a writer trying to do at least four of these things all at the same time – in their head. That’s like trying to build a car while driving it. This would ‘block’ anyone about anything. Then there’s the obvious point with the car, you won’t be able to get from point A to point B if your still building the car. How do I know this? Been there done that. Ah, heck I still do this from time to time. What’s important is recognizing what your doing then getting onto what you “need” to do. So don’t be a BLOCK HEAD and think your stuck, step back and start your design and stop the free writing for a minute. Throw something at the wall, see if it sticks then let that artist in you prep the room for the makeover and build a story. Anyone having a block head moment? What’s your plan to get out of it? Share/Comment – Looking forward to the discussion. Hi Cassie, I know exactly where you are coming from. I used to believe that some writers just sat down and effortless prose flowed from their fingertips. Your word above is quite right. That’s BullS8*t. Nobody does that. J.K Rowling spent five years plotting every little detail before she sat down and wrote a single word of the philosphers stone. Great Post Cass.